Join the new legend of Guruguru, where Nike, the reluctant hero, and Kukuri, the innocent heroine, return to save the world. The magical adventure that unfolds, with its unique monsters and eccentric characters, is sure to draw you into this curious and exciting realm. To save the world from evil King Giri, Kukuri must locate the monsters in each territory and win them, one by one, over to her side. Meanwhile Nike's task is to be recognized by the Four Kings of Nature and collect their swords. These swords are known as the "Sword of Wind," the "Sword of Water," the "Sword of Earth" and the "Sword of Fire." Can Nike and Kukuri truly become hero and heroine? Follow their journey and find out! 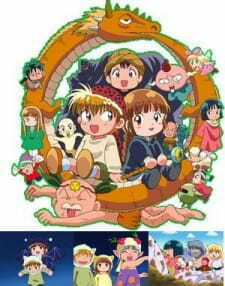 The Mahoujin Guru Guru 1 is like a masterpiece to me and this one... deceived me.